The most distinctive sign of an Irish soldier is probably his headdress, known as a caubeen. So highly individualistic is the caubeen that no two look alike: but what are the origins of this particular piece of headgear? It is said that the caubeen is the traditional headgear of the Irish soldier, although the only real evidence for this claim is a portrait of Owen Roe O’Neill, who led the Irish confederate force at the time of the civil war between Charles I and Parliament, wearing what might be said to be a caubeen. Whatever its origin, however, the caubeen had become accepted as being distinctively Irish by the early years of the Twentieth Century. When infantry regiments associated with the Irish Free State were disbanded in 1922, the War Office decided to approve Irish distinction for the serving regiments, including the approval for pipers to wear saffron kilts and caubeens. With this approval came the wearing of hackles. In the case of the two Fusilier regiments, they simply adopted their existing plumes when wearing the caubeen; gray for the Inniskillings and green for the Irish Fusiliers. The London Irish Rifles adopted Saint Patrick’s blue, a colour also used by the Irish Guards. 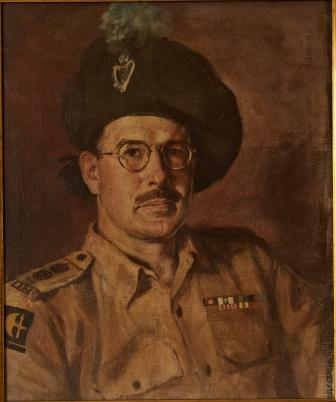 In 1937 The London Irish extended the wearing of the caubeen to all members of their regiment. They were the only soldiers to wear it through much of the war. It was not until the campaign in Italy, where the 2nd London Irish were a battalion of the Irish Brigade, that the caubeen’s popularity spread. The Caubeen outlasted the Irish Brigade. It became the accepted headdress for the Irish infantry regiments in the North Irish Brigade, with the Ulster Rifles adorning their bonnets with a black hackle. In 1968 the caubeen became the approved headdress for the Royal Irish Rangers. It continues to be worn on many occasions by the Royal Irish Regiment and remains in continuous use by the London Irish Rifles, now serving as a Company of the London Regiment. Whatever the doubts about its true origin it is firmly established as the headdress of the Irish infantryman. Adapted from ‘Clear the Way’ – a history of the 38th (Irish) Brigade, 1941-47 by Richard Doherty. Published by Irish Academic Press.